1. 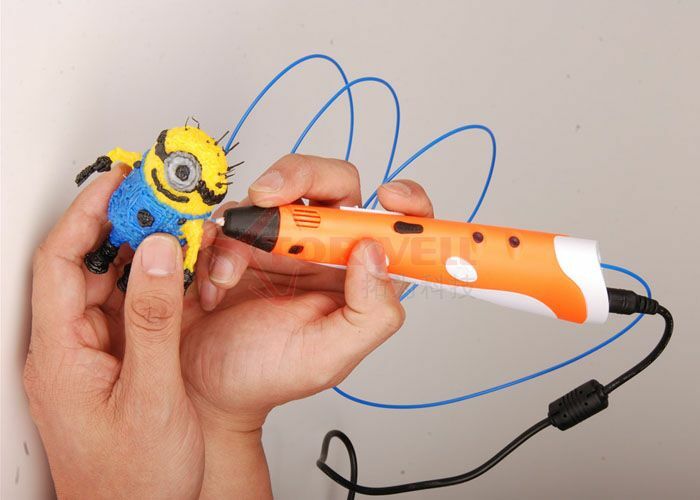 Put the power adapter AC plug into the outlet DC plug into the "power input" hole, the yellow LED turn on and the pen is started and standby. 2. 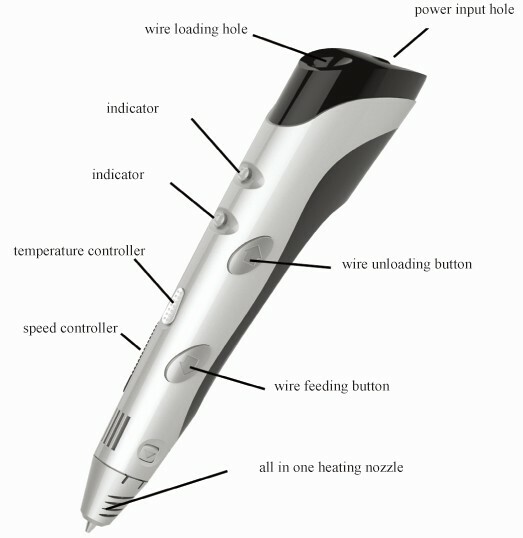 Press the "wire feeding" button, the red led turn on and the pen is under preheating. After o.5-2minutes later, the red led turn to blue, preheating finished the pen is ready to use. 3. Insert the consumable material into the" wire loading hole "which is at the end of the pen. Another hand keep on pressing the "wire feeding" button, the material will be loaded by built-in motor. 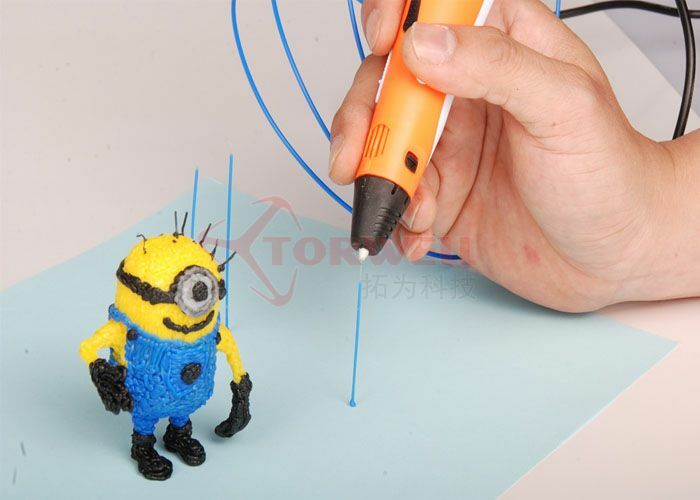 Wait there is plastic liquid come out from the nib nozzle, the material loading is succeed. 5. Do not touching the nozzle and heating parts during the drawing for your fasty. 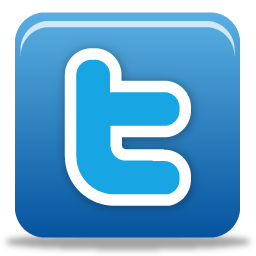 6.The device will switch to standby model if stop using over 5 minutes. The "working LED "will turn off, when use again, need press the "wire feeding" button to restart. 7.When need to unloading or change the material, please repeat the step 2 and keep on pressing on "wire unloading" button. "*"Heating time affected by the setting temperature and environmental temperature. "**"Must cut the material ending to smooth before loading the material. "***"unloading the material after each use is highly recommended. This device suitable for children 8 years old and adult use. Children should use it under adults. 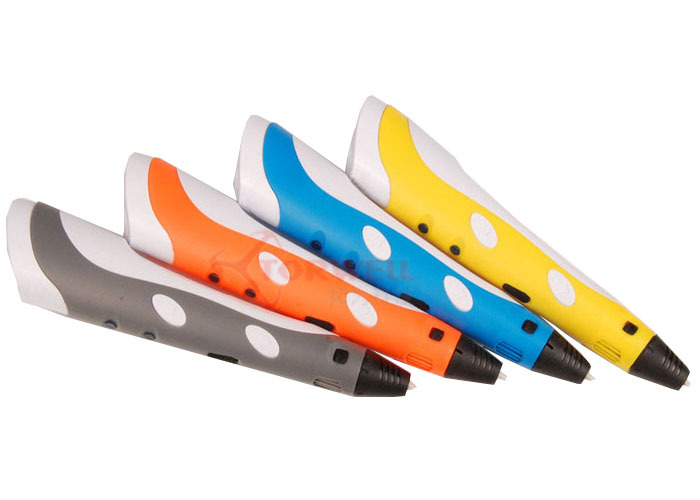 The painting pen nib and the near area are dangerous high temperature area, the highest temperature can reach 230°,do not touch the nib with hands or touch others objects with the nib. Do not block the wire loading hole with foreign body. Do not use non-official power adaptor from other company. Do not use non-official consumable material from other company.